Read my review of Frostblood! Is there a love-triangle in this book? Yes. Was it terrible? No. Though to be honest, love-triangles don't bother me too much—as long as they are well-executed. This actually reminded me a lot of Siege and Storm by Leigh Bardugo with the introduction of Sturmhond. If that didn't bother you, then this probably won't either. For those of who you haven't read The Grisha Trilogy (and AHEM, shame on you! ), let's put it this way: Ruby doesn't declare undying love for both Arcus and Kai and then go back and forth while deciding who to "pick" to be with. It's more like . . . she's struggling with her place in the world, and Arcus and Kai both represent the two opposing paths that she could take. 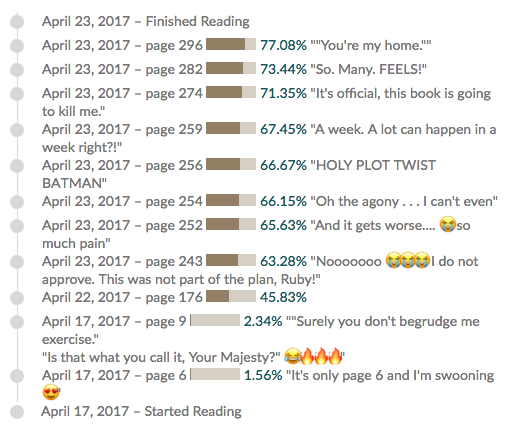 Basically, it's less about the romance, and more about what is happening plot-wise in Ruby's journey, and her own personal growth. 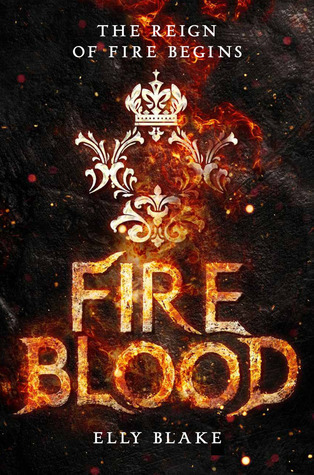 1) Fireblood's plot made me freak out multiple times. I couldn't sit still while reading this book because every other page was making me jump around with panic. I went from this . . . I was overwhelmed, shaking, and I couldn't tear through the pages fast enough. My heart was pounding, adrenaline was coursing through my veins, and I just couldn't believe how many twists there were to this book. To say that Elly Blake keeps you on your toes is putting it lightly. 2) I have to give Blake props for how much she's grown as a writer. I love Frostblood, but there is an obvious improvement in the writing and the plotting from that book to this one. There is a whole new depth to the characters in this story, and there is a new, enchanting setting to explore that utterly captivated all of my senses. It was as if the world and characters were coming right off the pages, and the book suddenly flowed like a movie in my mind. There was this wonderful balance of action and repose, and at the same time, there was never a dull moment. 3) It was obvious that everything wasn't going to be all puppies and rainbows for Arcus and Ruby, and I really enjoyed watching their struggle. I know, I'm horrible. I just love to watch my favorite characters suffer haha. It was fascinating to watch them, as well as their relationship, evolve, especially with Arcus now on the throne of Fors, and Ruby not being the only Fireblood around anymore. Watching their struggles just made me ship them even harder than I did before. Like with the first book, these two are on even ground—both leaning on each other for strength and love. I just. I love them so much. 4) There is a lot of new magic introduced in Fireblood! Honestly, some of the fantasy books I've been reading recently have been a bit lackluster in this department (with a couple exceptions, of course) but I loved the new displays of sorcery in this book. 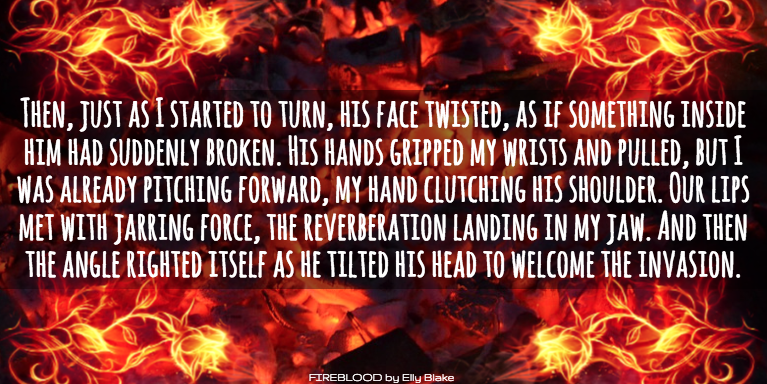 Elly Blake explores more of each character's powers and we see them develop in new ways. It's truly exhilarating! 5) Kai. Oh, he was so delightful. Honestly, I originally didn't want him in the book at all because I was afraid he'd threaten my ship, but he just oozes with charm and makes it impossible to resist him. He also has a wonderfully compelling backstory, and I love his dynamic with Ruby. 1) The wait for the conclusion to this trilogy might actually kill me . . .
"I told him this helps me think." "Yes. It helps me think of you." "I always fancy I smell singed meat when the Fireblood girl is near," she said in a booming whisper. The lovely Marella, who sat on the other side of the table, caught my eye and tilted her head to indicate Lady Blanding. "I always fancy I smell mothballs when the old crow dines with us." "Will you stop talking nonsense and help me back into bed?" He raised his brows in mock surprise. "I hardly know which statement to address, the accusation that my compliments are nonsense, or the invitation into your bed." I can't tell you how happy this review makes me! I was soooooooo worried about this sequel and really, you've made me look forward to this instead of just biting my fingernails and avoiding it an nervous anticipation! Ahh now I need to read Frostblood even more so I can hurry onto this one!! This series just looks BEYOND AMAZING - and I love all those points you made. Ahh I can't wait to get my hands on this one! I loved frostblood! 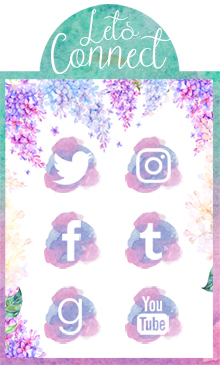 I'm glad you liked this one!! I really want to read Frostblood now, since this sounds amazing!! We'll see ;) Wonderful review!! Wow, sounds awesome! I want to try this series. Glad that you loved this book so much. I still need to start this. But maybe, maybe it'll be worth waiting until all three are out. I didn't read your review very closely about the details of the story, wanted to keep them all for when I read. But your opinions make me very excited to try these books out! I love that you do the same kind of updates on Goodreads when you're reading like I do! Great review! Oh wow! I was actually a little on the fence about continuing this series because I had mixed feelings about Frostblood. You have me completely sold on continuing now though! You've just blown me away with this review, Brittany!! I LOVE all of those Goodreads updates you've included, too. They're so cute! You have DEFINITELY convinced me that I NEED tor read this book, as well as the first one in the series, of course! These characters just sound SO AWESOME, and the plot twists guarantee that a reader will absolutely not get bored. AHHHHH!!! BRITANNY I AM SO JEALOUS THAT YOU READ THIS BOOK WHILST I AM DYING AND SUFFERING HERE FOR ARCUS AND RUBY!!!!!!! I AM GOING CRAZY RIGHT NOW!!!! And Kai sounds so dreamy and swoon worthy!!! I want to read this book now!! YES I love it too when the characters are tortured especially for two people who love each other! I'm so so excited you loved Fireblood. I loved Frostblood so much and I can't wait to read Fireblood! I didn't read your spoilers though, even though I really really wanted to, because I need to dive into this book as soon as I get a copy for myself. I haven't read the first book, but yeah, now I really want to read both it and this book! Great review! Thanks for stopping by! Happy reading!